This compact disc contains all of her early works for piano. The set which opens the disc, Sketches, op. 15 (1892) was written after her marriage to Henry Harris Aubrey Beach in 1885. Each piece of the cycle is preceded with a line of poetry. “Feuillages jaunissants sur les gazons épars” (Yellowed leaves are scattered on the grass) is an excerpt from a poem by Alphonse de Lamartine which is written at the top of In Autumn. In F# minor, this opening piece is jaunty and light, perhaps a bit reminiscent of Schubert. At the beginning of Phantoms Beach quotes a line by Victor Hugo: “Toutes fragiles fleurs, sitôt mortes que nées” (All the fragile flowers die as soon as they are born). In ABA form, Phantoms is in 3/8, with an emphasis on the second beat of the bar, lending it a mazurka-like feel. Dreaming quotes another excerpt by Hugo, “Tu me parles du fond d’un rêve” (You speak to me from the depths of a dream). It opens with triplet figuration between the hands which continues throughout in accompaniment of the long notes in the melody. Another quote from Lamartine is used under the title of Fire-flies: “Naître avec le printemps, mourir avec les roses” (To be born with the spring, to die with the roses). This piece was played by Ferucio Busoni, Josef Hofmann and Moritz Rosenthal, giving evidence to the popularity of these works during Beach’s lifetime. Passages in thirds occupy the right-hand and convey the flitting of fireflies as they light up the night sky. Beach was singing at the age of one, always in the same key in which the song had been taught to her. She was making up original melodies from a very early age, and singing harmony by the age of two. Her mother kept her away from the family piano until she was four, as she did not want Beach to have the life of a musical prodigy. Nevertheless, Beach was extraordinarily gifted, having a prodigious memory, perfect pitch and describing keys as colours. Beach described a piece by asking her mother to play a piece that was a particular colour, e.g., ‘pink,’ for E-flat major. Beach’s mother limited her time at the piano, and only began to teach her piano formally at the age of six. By seven Beach was playing Bach fugues, Chopin waltzes, Beethoven sonatinas and performing in public. She was offered contracts by several concert managers, all turned down by her parents. Her mother took the decision that Beach would not play any more in public because of her young age. In 1875 her family moved to Boston, and in 1876 Beach began to study privately with the pianist Ernst Perabo, who taught at the New England Conservatory of Music. Mamma’s Waltz (1872) was composed in her head and away from the piano at the age of four. It is one of four waltzes she wrote that summer, and it was later put down on paper by her mother, an amateur pianist and singer. Beach herself notated it down several years later in the manuscript which survives. Evidently Beach had perfect musical memory, in that she only heard things one way in her head, and in only one key, so her recall as to how she would have played this piece as a young child would be exactly how she always played it. Regularly phrased, Mamma’s Waltz is in simple rondo form, with two different sections contrasting with the opening material. Menuetto (1877), Romanza (1877) and Air and Variations (1877) were all written when Beach was ten years old. Menuetto is a precursor of the Menuet italien of op. 28. In A-flat major, the first half of the piece is in rounded binary form. Beach then puts the main theme in the parallel minor. An eight-bar harmonic progression follows which brings the piece back to a restatement of the opening theme. Romanza shows Beach experimenting with modulation as she moves skilfully from the opening key of D major into F-sharp major eight bars later. Petite Valse (1878) is a charming waltz in D-flat major, a forerunner of the Danse des fleurs of Op. 28. Beach follows a structural organisation similar to the Menuetto: a binary form is followed by a move to the parallel minor, D-flat minor, and then a nicely handled modulatory sequence back to a statement of the opening melody in D-flat major. Air and Variations is a larger work and evidence of Beach’s technical development as a pianist. The theme is first presented simply in A minor. The variation which follows requires repeated-note facility in the right-hand. The second variation moves into F major with sextuplets in the right-hand. Beach moves back into the key of A minor with a presto variation which is light, quick and fun. A final variation, with the melody in the left-hand accompanied by groups of four notes running up and down the keyboard, brings the set to a somewhat unexpected conclusion. In 1882, Beach began studying piano in Boston with Carl Baermann, a pupil of Liszt’s. Her mother did not allow her to tour extensively, nor would she let her go to Europe for further study. She was permitted to make her debut in 1883 at the age of sixteen with Ignaz Moscheles’ Concerto No. 2 in G minor in Boston’s Music Hall. She also had her first composition published this year, “The Rainy Day.” This is a song set to a text by Henry Wadsworth Longfellow, for whom Beach had played. Beach performed as a recitalist and concerto soloist in and around Boston for the next several years until her marriage to H.H.A. Beach, a well-respected Boston physician twenty-four years her senior. Beach learned harmony with Junius Welch Hill for a year in 1881-1882, a church organist and teacher at the Boston Conservatory of Music. Otherwise, Beach taught herself composition by extensively studying scores, textbooks and musical treatises. Her career as a composer was helped by being taken on by the Boston publishing firm of Arthur P. Schmidt in 1885. Schmidt published every work Beach wrote for the next quarter of a century. Upon her marriage in 1885, Amy Marcy Cheney became Mrs. H.H.A. Beach. The name gave her standing in society, and protected her reputation as a woman appearing on the stage as a performer. Her husband did not permit her to accept performance fees, as he, her husband, was the provider. But he did allow her to play in aid of charities and encouraged her development as a composer. After the Petite Valse of 1878 there is a gap in Beach’s compositional output for piano. The next surviving piece is Valse Caprice, op. 4, premiered in 1889 by the composer herself. It was championed by the pianist Josef Hofmann, who used it frequently as an encore. The figuration of the opening introduction is as if a curtain is being raised at a ballet. And then the dance begins. Beach decorates the melody with light grace-notes, lending an improvisatory, and, indeed, capricious air to the work. It is not a straightforward waltz, but rather a rhapsody using the waltz as a point of take off. Beach wrote many songs for voice and piano and a plethora of sacred and secular choral works, including the Mass in E-flat, op. 5 (1890). She began work on her Symphony in E minor, “Gaelic,” op. 32, in 1894, the year in which the remainder of the piano pieces on this disc were published. The symphony was completed in 1896, and remains one of her abiding works. 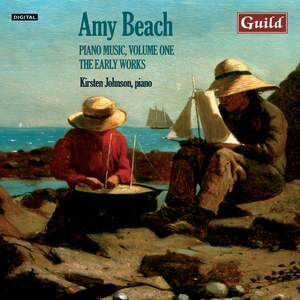 Amy Beach’s later oeuvre includes Sonata in A minor for piano and violin, op. 34 (1896); Concerto for Piano and Orchestra in C# minor, op. 45 (1899); Quintet for Piano and Strings in F# minor, op. 67 (1907); an opera, Cabildo, op. 149 (1932); and Trio for Piano, Violin and Violincello, op. 150 (1938). Beach uses her song, “O my luve is like a red, red rose,” op. 12, no. 3, with text by Robert Burns, as a basis for Ballade, op. 6 (1894). After a brief introduction, the melody enters, accompanied with flowing triplets between the hands, a pattern similar to that used in the song setting. After completely working through the theme, Beach begins again, initially in D-flat minor, letting the left-hand take over the melody. The theme remains in the left-hand, but with more passionate decoration from the right-hand, eventually moving to E major for a brief sojourn, before a reprise in the original key. A section titled Allegro con vigore ensues, portraying the words of the third stanza of Beach’s art song: “Till a’ the seas gang dry, my dear; And the rocks melt wi’ the sun; I will luve thee still, my dear; While the sands of life shall run.” Bold and tempestuous, this builds in a fervour of emotion to a climax. From the sustained unison octaves emerges a pianississimo Lento, a quasi-cadenza on the opening melody. This ushers in a final section which combines the material from both sections, building to a final statement of the theme in large chords and octaves. Utterly depleted, the Ballade winds down, fading into the distance, ending beautifully still. Bal Masque, Op. 22 (1894) is a waltz in the Viennese tradition. It demonstrates Beach’s affinity with the form, having heard her mother play Strauss waltzes at the piano from her infancy. In ABA form, the first section is preceded by a short introduction establishing the key of G major. The middle section is in E-flat major, and is warmer and more intimate in sound. Beach decorates the ‘A’ material in the restatement of the theme, imitating various woodwind instruments in her working of the material. She also arranged this work for orchestra. Children’s Carnival, op. 25 (1894) is a set of pedagogical pieces, charming and accessible miniatures which depict a carnival festival using characters whose roots lie in the Italian commedia dell’arte. The set opens with a march, Promenade, the procession of entertainers through city streets. Next is Columbine, a quiet piece inspired by the character of a young woman, sometimes portrayed as the lover of Harlequin. Pantalon, the next movement, is based on the character by the same name, an older man who is often cast as the father of Columbine. Pierrot and Pierrette follows, a gentle waltz in two parts, each section repeated. Pierrot and Pierrette are two clowns. Pierrot is desperately in love with Pierrette, but she falls in and out of love with him. Secrets is a lovely andantino in D major with the melody hidden between the hands, a duet of two voices juxtaposed on different parts of the beat. Children’s Carnival concludes with Harlequin, the acrobat of the menagerie, conveyed in a quick, light melody that dances around the keyboard. Trois morceaux caractéristiques, op. 28 (1894) is a set of character pieces. It opens with Barcarolle, a lovely evocation of a boat-song. In 6/8 time, the undulating left-hand accompaniment provides an ongoing support for the right-hand melody. The middle section of this piece in ABA form is in E-flat major. The left-hand introduces the main theme of the section, which is developed in an expansive way with full chords. After reaching a climax, Beach backs away, using the theme in a quieter fashion to usher in a more embellished restatement of the opening barcarolle melody. The second piece, Menuet italien, is an expanded version of the earlier Menuetto. Beach uses much of the same material to begin with, but in a more complex way, adding passing tones and secondary lines. There is now a middle section in C minor, a kind of trio, with artfully written passagework decorating the line. Danse des fleurs, marked Tempo di Valse, is the final morceau. In D-flat major, the opening theme, shared between the hands, leads to transitional material which develops the motive. The second theme is beautifully presented in the key of C# minor, and is followed by more use of the transitional material of the first section. Beach builds this to a climax before returning to the opening melody to round off the work.